The yogis call the time prior to the big Bang the Unmanifested consciousness and after the Big Bang when matter and polarity is created, the separation between the Unmanifested and Manifest Shiva (creator) and Shakti (the destroyer). Matter (Prakirti) is composed of 3 aspects or in Sanskrit Gunas. Gunas cannot be destroyed but the dominance of Gunas can be changed to change our perception of life. I am going to relate the 3 gunas to the flavours of food. The flavor of a fresh raw apple, in its pure essence we could relate to the sattva guna. When we add some spices and sugar to the apple it changes its true state to something different, something warming, expanding our taste buds, we have created something new and exciting out of the original pure taste of apple, a flavor of rajas guna. If we get that same apple and ferment it, a process of deterioration into its sugary and finally alcoholic parts to make cider. When we drink cider it makes us slow, our limbs feel heavy, we feel attached to our opinions, too much may make us feel angry or confused, this is the tamas guna. It will stop the negativity of the mind and put it in reverse, it is a mantra that will reverse the downward spiral of the thoughts. Chant it with reverence as it is really powerful and then make sure your words and thoughts are positive. We will also be practicing the Tershula kriya this week which balances the gunas. Tues 19 Feb 4.00-5.30pm Poya Gong Bath Shaunagh@ Prana Lounge. Sat 23 Feb 6-7.30pm Gong Bath @ Sri Yoga Shala, Thalpe. We have all experienced reading a few lines or in fact pages in a state of automatic pilot and not being able to recall any of it. This is our body’s clever way of saving fuel. Our conscious brain is a gas guzzling high powered machine when we concentrate, for example like learning a new language. To be more efficient our subconscious brain takes over, it looks at what we are experiencing now and sees if it looks familiar with a previous experience. If it does, it assumes that the experience is the same as yesterday and behaves in the same way. It creates a blue print of your daily life and feeds you this reality again and again. No wonder we feel bored, no wonder small kids say, “I know that Aunty”. It is estimated that we spend 80% of our life on autopilot or subconscious pilot! This means that majority of life is habituated doing what we regularly do and not seeing the unique context of that moment as a separate time (fourth dimension) in three dimensional space. Our life is lived in a dull blur. We resist the now and the new. We need to override this autopilot. Each time you notice you are on autopilot, or the next time you take a drink of water, tea, etc. Take a slow deep breath in through your nose, hold the breath, exhale through the nose, smile and ask yourself, “what is needed now?” Because it is different to what was needed yesterday. Just by doing this you will have taken yourself off autopilot and switched on your high powered intuitive, brain. Enjoy, life is here to be experienced not thought about! “Just Relax”. It seems such an easy thing to say and do, but in reality, on a deeper level, relaxation is difficult for most people to achieve because of the subliminal level of emotional conflict or duality we exit in. We tend to live life through a mask or persona. This persona is created through the unconscious habits and patterns or maps in our mind which then triggers a secondary level of projected emotions. Even as we go about the normal day to day routine, there is an inner emotive dialogue that generates patterns of anxiety, anger, hopelessness or self-defeating emotions. I first notice this when I left my high stress job, as a lawyer working on a high profile Public Inquiry into a disaster in London and moved to peaceful Quito, the capital of Ecuador. Suddenly there was no longer a logical reason to feel stressed but that underlying feeling starting to creep up from under my skin. I was happy, newly married, financially very well off and enjoying a new beginning in South America a long-term dream fulfilled, yet here I was feeling anxious! It was not until I started Kundalini Yoga and a deep meditation practice that I came to understand that this anxiety was not logical or as a result of circumstances, but a deep-seated feeling of duality we all experience at some level. 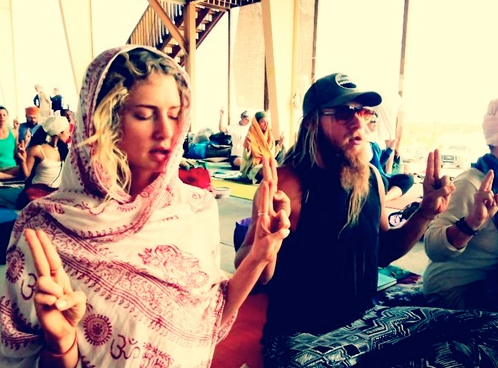 In Kundalini yoga, what I described above as my life is called commotional living. It drains the reserve energy of your nervous system and creates defences and armoring against discomfort. The key to release this is through deep relaxation. But this is not simply better or more sleep, a massage or time off. To truly, deeply relax we need to change the distribution of prana, the vital lifeforce energy and relax the nervous system to allow reorganisation of patterns of being and doing. On a more subtle level we need to relax into our core self by letting go and trusting that we are not solely the doer. If you can relax about the unknown, the infinite or generator, organise or destroyer (GOD) 75% of your tension will go away. With this realisation, we can be relaxed under the most stressful situations, as we remember our identity or Real self, the soul in the most unreal situations. As yogi Bhajan says, “Total harmonious relaxation cures the body. To achieve this there must be a coordination between the 3 facets of ourselves: body, mind and soul”. Rejuvenating the parasympathetic nervous system. Releasing rigid patterns in the muscles and promoting blood flow. 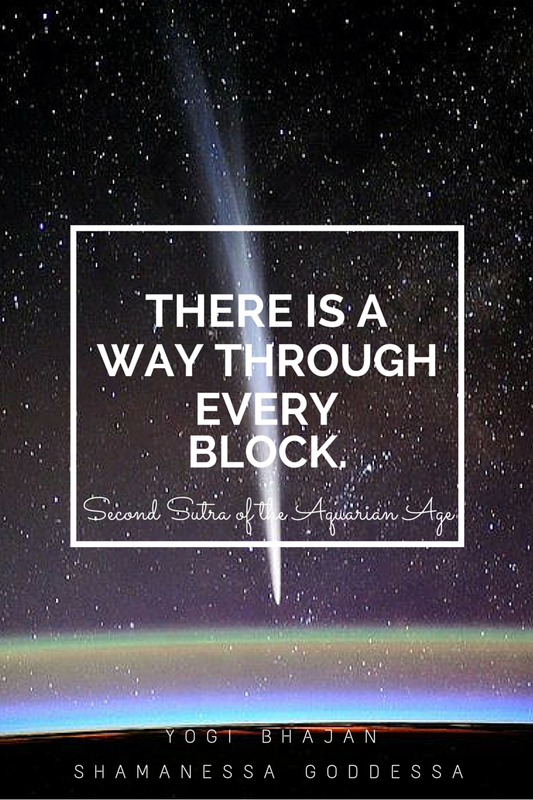 We do not realise it but we actually block ourselves. We get entangled in our emotional wants and needs which fail to serve our real heart’s desire for connection with our infinite self. Sometimes we do not recognize that our finite experience in the human body is in part to create a polarity so we can experience the Infinite. The finite and the Infinite are like two hands which are there to both serve our heart. We feel the desire to expand and touch that infinite nature. But when we settle for these finite goals, instead of understanding that these things are an expression of our infinite nature not our hearts desire, we get stuck. As Yogi Bhajan put it, we settle for a single peanut butter sandwich instead of the ongoing feast of plenty that will continue for all our lives. In order to elevate ourselves as human beings and to stay on the path of our spirit, there are simple tools that can help us. They give us the clarity, courage and consciousness we need. This meditation is one of those tools. The practice of this meditation, even briefly, locates you in your heart, opens your perception, and lets you immediately recognize the way forward. All the blocks that seemed absolute dissolve. When darkness and struggle seem to surround you, a ray of light finds its way in and it is even easier to see through the darkness. This is a state of ordinary miracles. This is a steady state of gratitude to see the constant flow of miracles that accompany you on your path. That is Dharma! Posture: Sit in a comfortable cross-legged position with a straight spine. Mudra: Bring the hands in front of the throat, forearms parallel to the ground. The left hand is palm down; the palm is flat and the fingers point to the right. Extend the left thumb toward the throat. Bring the right thumb between the left thumb and index finger, placing it in the center of the left palm and allow the fingers of the right hand to rest on the back of the left hand. Lock the right thumb in place and apply firm pressure on the left palm. Hold the position at the level of the throat about six inches in front of the body. Be sure to keep the arms parallel to the ground. The key to this meditation is locking the right thumb and keeping firm pressure on the center of the left hand. Your thumb may become sore after a while but be strong and don’t give an inch. Gong and Breath Class Sat 17 Oct 6-7pm at Prana Lounge, 60 Horton Place, Colombo 7. Investment 1000Rs.